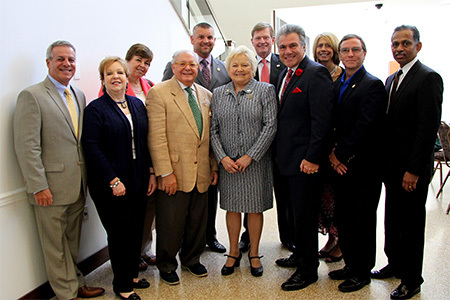 West Windsor, N.J. – The business community paid tribute to retiring Mercer County Community College (MCCC) President Patricia C. Donohue at a June 10 breakfast reception hosted by the New Jersey Business and Industry Association (NJBIA), the MIDJersey Chamber of Commerce and the Princeton Regional Chamber of Commerce. Area business leaders gathered at the Conference Center on Mercer’s West Windsor Campus to express their appreciation to Dr. Donohue for her significant contributions to the Mercer County business community during her eight-year tenure at MCCC. Dr. Donohue’s final day on the job is June 30. Participating in the ceremony were Mercer County Executive Brian Hughes, who presented Dr. Donohue with a proclamation from the county; Michele Siekerka, President of the NJBIA; Peter Crowley, President/CEO of the Princeton Chamber; Robert Prunetti, President/CEO of the MIDJersey Chamber; Don Tretola, Vice President of Public Affairs and Program Development of Allies, Inc.; Sivaraman Anbarasan, CEO/Executive Director of NJCC Consortium for Workforce & Economic Development; Beverly Mills, Director, and James Purcell, Chair, of the Mercer County Workforce Investment Board; and Victoria Monaghan, Manager of Strategic Relations in Higher Education at Educational Testing Service. Pictured with President Donohue (center) are, front row from left, Robert Prunetti, MIDJersey Chamber of Commerce; Mercer County Freeholders Ann Cannon and Pasquale Colavita; Don Tretola, Allies, Inc.; Jim Purcell, Chair of the Mercer County Workforce Investment Board; and Sivaraman Anbarasan of NJCC Consortium for Workforce & Economic Development; back row from left, Victoria Monaghan of Educational Testing Service; Mercer County Freeholder John Cimino; Peter Crowley, Princeton Chamber of Commerce; and Michele Siekerka of NJBIA. Participating in the tribute, but not pictured: Mercer County Executive Brian Hughes and Beverly Mills of the NJ Workforce Investment Board. 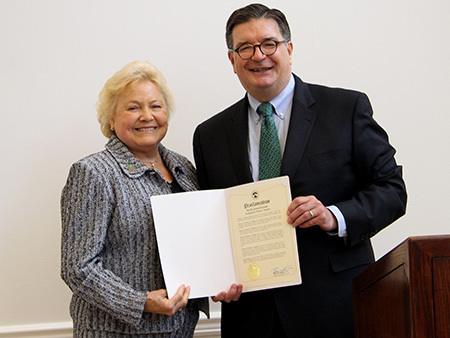 Dr. Donohue received a proclamation from Mercer County Executive Brian Hughes honoring her for her service.